This year Sukkot was celebrated by WUPJ Communities across the Asian continent this year with much joy and in a uniquely Asian style. At the United Jewish Congregation in Hong Kong, their Sukkah frame survived the lashings of Typhoon Mangkhut which swept through the city before Yom Kippur. Luckily there was no s’kach covering on top of the Sukkah at the time! At the Family Sukkah party the children decorated the decorated the sukkah with paper chains and “jeweled fruit” (see picture). With the Chinese Mid-Autumn Festival coinciding with Sukkot, the paper lanterns decorating the sukkah served a dual purpose this year! For the last several years the Jewish Community of Japan have given Sukkot in Tokyo a local twist. Erev Sukkot saw their Sukkah full to bursting as congregants enjoyed a multi-course Japanese buffet dubbed “(More than) Sushi in the Sukkah”. 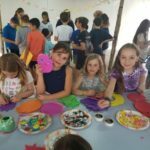 The children decorated the Sukkah with Japanese lanterns and colourful origami cranes, which they inscribed with the names of Ushpizin, guests that they would like to visit them in their Sukkah. The United Hebrew Congregation in Singapore held a miniature-Sukkah building competition in their Religious School. This was fiercely contested acoss twenty-four entries, which made the awarding of prizes very difficult. 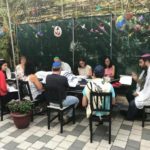 Once again a Sukkah was built in the Jungle amid great humidity, and for the first time Shacharit prayers with a Torah reading were held in the Sukkah on the morning of the first day (see picture). 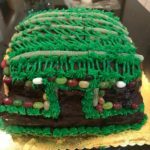 An edible Sukkah Cake was also lovingly baked (see picture) but was eaten in double-quick time! 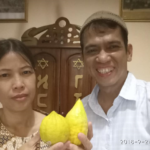 In Indonesia, comparisons were made between locally grown Etrog and those that were imported from Israel (see picture). As recent research by David Z. Moster has shown, the Etrog may well be Chinese in origin, in which case with the flourishing of Judaism in Asia the Sukkot fruit is returning to its roots! 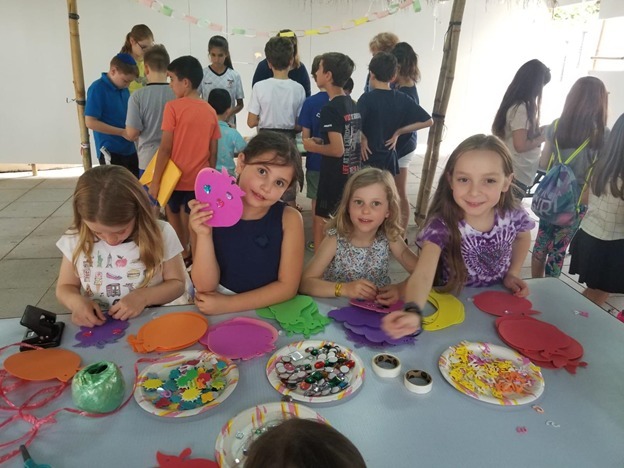 Kehilat Shanghai celebrated Sukkot with Tov!, their new religious school that numbers thirty-six students spread over four age levels. From January 24-27 2019 there will be an Asia Progressive Judaism Summit hosted in Singapore. Details here: https://www.uhcsingapore.org/apjsummit2019 If you are interested to see the growth and development of Progressive Judaism across the Asian continent, this is a wonderful opportunity to experience it at first hand. Please fill out this form to share "[ASIA] Sukkot in Asia 5779" via e-mail.